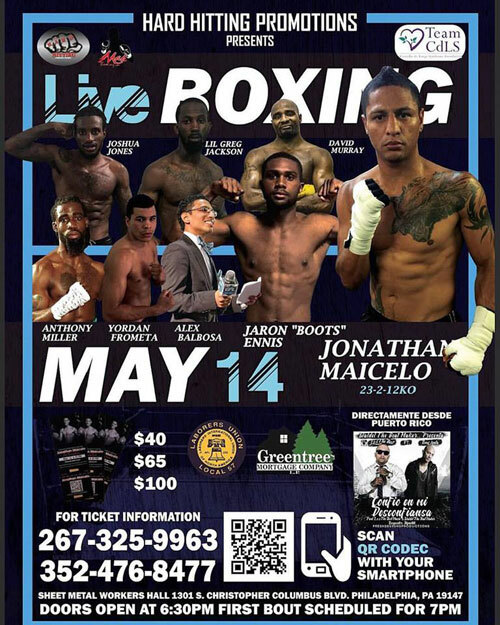 Pro boxing returns to South Philly's Sheet Metal Workers Hall Saturday night when Hard Hitting Promotions stages a nine-bout card that is packed with local and visiting talent. Promoters Manny Rivera and Will Ruiz hosted a press conference Thursday night at the Laborers Local Union No. 57 Hall in Center City Philadelphia to publicize the show. In the main event, North Bergen-based Peruvian lightweight Jonathan “The Last Incan” Maicelo, 23-2 (12 KO), takes on upset minded Ramesis Gil, 10-14-5 (7 KO), of Puerto Rico, in an 8-rounder. Nelson Fernandez, who also handles WBA interim featherweight champion Carlos Zambrano of Peru, interpreted for Maicelo. “Maicelo is in good shape and isn’t underestimating his opponent," Fernandez said. Maicelo thanked the promoters for the opportunity to fight in the main event. The evening's co-feature puts the spotlight on Philly’s welterweight and national amateur champion Jaron “Boots” Ennis, 1-0 (1 KO). The outstanding former amateur, and one-bout pro, fights before his hometown crowd for the first time since becoming a professional. Ennis made his debut a two weeks ago in Utah, scoring a first round knockout in just 42 seconds. Ennis laughed when he was asked by this writer, “How does it feel to just be 48 fights away from Marciano and Mayweather’s record 49-0?" Ennis appears to be the best prospect in Philly since Meldrick Taylor, a 1984 Olympic Gold Medalist and two-division world champion as a pro. Saturday, the young Ennis fights Puerto Rican Luis Ramos, 0-1, in a four rounder. “I want to get in and get out like a robbery,” Ennis said. Jaron comes from a fighting Philly family that includes his two brothers, Farah “Quiet Storm” Ennis (former NABF champ) and Derek “Pooh” Ennis (former USBA champ), and their father Bozy, who was a boxer himself, before becoming the trainer for his sons as well as many other local fighters. Light heavyweight David Murray, 3-1 (3 KO), out of Newark, DE, returns from Hard Hitting’s last event where he scored a first round knockout. Murray takes on Ken Clairborne, 4-11 (3 KO), of Ft. Worth, TX, in a four round bout. “I want to thank God and my trainer Greg Pritchard,” said Murray. Murray credited his work ethic as the key difference between he and other fighters. But that's not all. "I discovered when I started boxing I had a powerful right hand. I only had 15 amateur bouts." Philly welterweight Greg Jackson, 6-2 (2 KO), fights Mexican Joel Vargas, 4-16-2 (4 KO), of Liberal, KS, in another four rounder. Jackson is now trained by Bozy Ennis. “Bozy has got me boxing instead of just going in slugging,” said Jackson. His former trainer was in the audience who he gave a thank you to and told Hopkins he is his favorite boxer. Regular ring announcer Alex Barbosa, 4-2-1 (1 KO), returns to the ring after 18 months of inactivity, handing the microphone over for a pair of boxing gloves. Alex faces Marquise Pierce, 1-8 (0 KO), of Wheeling, WV, in a four round bout. In his pro debut, Pierce defeated Jeffery Dorsey, the grandson of Larry Holmes, but has lost eights straight fights since. When he is not announcing - or fighting - Barbosa works at the UFC Gym in Cherry Hill, NJ. Pat Michael Fattore will step in for Barbosa as Saturday night's ring announcer. He also was at the microphone for the Thursday's press conference. Cuban super lightweight Yordan Frometa, 8-0 (6 KO), escaped Cuba to Quito, ECU, and now fights out of Miami, FL. “I was 128-8 as an amateur,” said Frometa. Saturday he fights a 6-rounder against Dominican Ken Alvares, 7-3-2 (3 KO), of PR. In another 6-rounder Wilmington, DE, welterweight Anthony Miller, 3-1 (3 KO), meets Gledwin Ortiz, 3-1 (3 KO), of the Bronx, NY. Ortiz previously lost a split decision to Greg Jackson in Hard Hitting’s last show. All the way from Italy, super middleweight Daniel Scardine, 4-0 (4 KO), now fighting out of Miami Beach, FL, fought all four of his previous pro bouts in the Dominican Republic. He was also 42-15, as an amateur. Saturday, Scardine fights Oklahoma City's Steve Crowfield, 2-3 (0 KO), in a 4 rounder. “I want to thank Manny (Rivera) and Will (Ruiz) for bringing me in for this show,” said Scardine. In the opening bout Saturday, Raul Lopez, 9-2-1 (4 KO), Bronx, NY, takes on southpaw Edgar Cortez, 2-1 (1 KO), Vineland, NJ, in a 4-round featherweight bout. Joining the festivities was two-division world champion and Philly legend Bernard “The Alien” Hopkins. At 51, "B-HOP", as most refer to him, still looks like he’s in his 20s. Hopkins stayed after the press conference ended, talking and answering questions. Also in the audience were Villanova’s Jalen Brunson, who was part of the NCAA basketball championship team, as well as Brandon Pizzaro, one of Philly's top amateur trainers. Rounding out the crowd were John Mirenda & John Varano, backers of Hard Hitting Promotions. The doors for the event open at 6:30 PM on Saturday, with the first bout at 7:00 PM. The Sheet Metal Workers Hall is located at 1301 S. Christopher Columbus Blvd., in South Philadelphia. If this show is as good as their last show it would be well worth attending.